Once again, this year will see the release of multiple big budget Marvel superhero movies including Ant Man and the Wasp and Black Panther, both of which will feature some car cameos disguised as product placement. A , but before then the Lexus LC 500 will make its cinematic debut in Black Panther. Ahead of the film’s release next month, Marvel has released a short clip of Black Panther's main car chase scene showing the sleek sports car in action. We get to see the titular hero perform a backflip onto the LC 500 and cling onto its roof while the 471-hp sports car is driven by Black T'Challa's 16-year-old sister, Shuri. Jeremy Fry, , did the stunt driving in Black Panther. But unlike Baby Driver, the action in this car chase scene features copious amounts of computer generated effects. The chase quickly intensifies when the LC 500 tails a Toyota SUV with gun-wielding enemies while weaving through traffic on a bridge. Using his technically advanced suit, he absorbs the kinetic energy from the bullets firing at him to create a blast wave that causes the SUV to flip over in a spectacular CGI crash. Like we said, don’t expect realism in a superhero movie car chase scene. 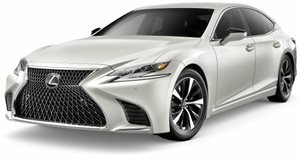 Lexus teamed up with Marvel to create a special edition version of the LC 500 coupe called the LC Inspiration Series featuring a unique deeply saturated iridescent Structural Blue finish, 21-inch forged alloy wheels, and a bespoke white interior. In the movie, the LC 500 has fictional abilities like a camouflage mode that makes the car invisible and a fully autonomous driving mode as seen in the clip. You’ll be able to see the Lexus LC 500 in action on the big screen when Black Panther releases in cinemas February 16.